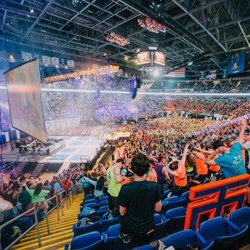 On February 15th, the world’s largest student-run philanthropy – Penn State University’s THON – will kick-off in State College, Pennsylvania. 16,000-plus students, families and alumni will come together for a 46-hour, no-sleep, no-sit, dance marathon raising money to fight childhood cancer. The weekend event raises more than $10 million annually to financially, and emotionally, support families struggling with pediatric cancer as well as innovative research at the Penn State Children’s Hospital. When Michael was six years old, he was diagnosed with Leukemia. He doesn’t remember much about the three years he spent receiving treatment, except, in 2004, when his parents took him to THON – the 46-hour no-sit, no-sleep dance marathon that raises millions of dollars annually to combat childhood cancer. He hasn’t missed another THON since. In addition to having his medical costs covered through THON, Michael was also “adopted” by the Sigma Phi Epsilon fraternity, whose members visited Michael throughout his treatment. Now, Michael is paying it forward. As a student at Penn State University, a member of Sigma Phi Epsilon and a volunteer for THON, Michael is working tirelessly to help raise more than the $10 million that was raised in 2018 to pay medical bills (like the ones that THON covered for his family) and to fund life-saving research. Penn State University’s field hockey team is working together to do more than just win games – they’re helping to raise millions of dollars to combat childhood cancer. Jenny Rizzo, a 21-year-old goalkeeper, is leading this effort along with her impassioned teammates. As a Hershey, PA resident, Jenny was always aware of Penn State University’s annual charity, THON and while looking for colleges was excited to learn how she could be involved. Moreover, the Field Hockey team is extremely passionate about fundraising for THON, especially since their athletic trainer’s daughter, Isabella, survived childhood cancer and is currently 5 years cancer free. As a team, they raised over $8,000 in the last two years. Additionally, as a student-athlete, and previous member of the THON dancer relations team, Jenny has used her expertise to help THON dancers with their stretches and exercises as they prepare to dance for 46 hours. Jenny is looking forward to dancing this year and knowing everything there is to know about preparing for the dance a thon. As a student and director of THON 2019, Kelly manages hundreds of dedicated student volunteers and spearheads the organization and its efforts to raise millions of dollars to benefit childhood cancer patients and their families.